AR is a technology that allows the digital world to be overlaid on the physical world, but you are still really in the physical world (anyone remember Google glass?). VR, on the other hand, immerses you in a digital world and totally takes away the physical. Both solutions use similar technologies to achieve different results. Augmented Reality is a complicated fish and I think this will still take a while to go mainstream. Despite all the excitement caused by Google glass, it still remains in development as of Dec 2015. Currently AR doesn’t enjoy mass appeal and is somewhat relegated to niche applications. It hasn’t made the news like VR in recent times and still seems to be stuck in the lab. Apple’s recent acquisition of Metaio, an augmented reality , does show this is a technology not to lose track of. Virtual Reality, on the other hand, is beginning to look like a solution that is getting ready for major adoption; yes it’s still in its infancy if you consider what we could achieve with the technology, but for simple applications right now, it’s already delivering. VR is not new either, it’s been around since the mid 90s and has mostly been held back by cost and technology limitations of the time. T have changed though. The application potentials are numerous and could be the most interesting tech to happen in 2016 and beyond, not just in developed countries but also in Nigeria and other African countries. Brands are already doing impressive stuff with VR, one of which is streaming live video content to remote headsets, thus putting the viewer in the middle of the action. Imagine watching a streamed live match in VR of your favourite football team. It’s been done. When you think of VR, the one name that seems to come to everyone’s mind is Oculus, the VR firm that was purchased in 2014 for about $2.1 billion by social network giant Facebook. In reality though, several other big names are actively involved in VR in one form or the other. Google has its Google cardboard, which practically zeroed out the cost of the device by making it dirt cheap for just about anyone to experience the technology. Google also has a number of consumer apps available that make it easy to create and enjoy basic VR content on your mobile devices. The search giant also backs Magic Leap, a very interesting VR company I am watching. Microsoft has its own cardboard VR kit, plus a product it’s calling Hololens. HTC has its Vive, which for me looks to be the most promising. Sony has its Project Morpheus, which is being touted as the big name in VR gaming and will integrate with Sony’s PlayStation devices. You also want to check out Avegant’s Glyph, which integrates a headphone into their device. For those interested in open source solutions, Razer OSVR is available and is being developed to be cross platform. Zeiss, of “Carl Zeiss” optics fame, should also not be left out. They have what they’re calling “VR One.” Many of these players are making multi-billion dollar bets on the future of VR. 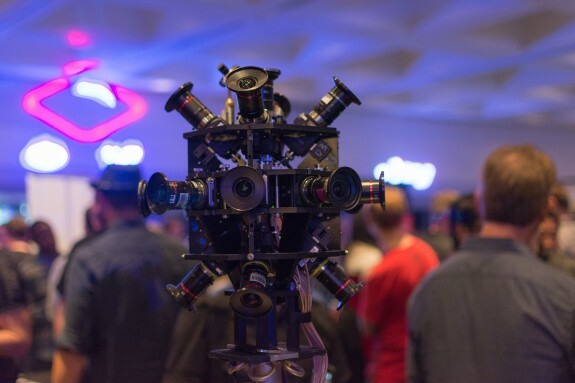 Los Angeles CA – USA – August 29 2015: 360-Degree Virtual Reality Camera System during VRLA Expo virtual reality exposition event at the Los Angeles Convention Center in Los Angeles. 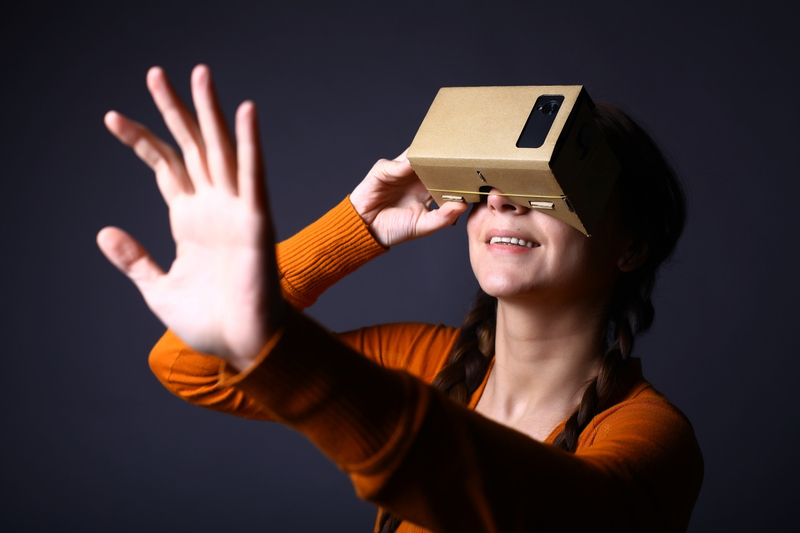 Color shot of a young woman looking through a cardboard a device with which one can experience virtual reality on a mobile phone. To put it all in perspective, this year alone, more than 40 exhibitors displayed various virtual reality systems at CES (Consumer Electronics Show). There are lots and lots of players in the VR space, not to even mention the thousands of cheap plastic options available from Chinese producers that work surprisingly pretty well, and I haven’t even begun talking about the software side of things or the extremely complicated production/creation side of things. Facebook and YouTube now support VR content that doesn’t require the viewer to use a headset. It’s not the same experience, but it’s a step in the right direction since several people have pointed to the size of the current headsets as one of the factors affecting adoption. With Facebook’s purchase of Oculus and their plan for social media, I can only begin to wonder what social networking will become in the next few years. Some VR questions to ponder. Will Social VR become reality any time soon? Will I be in Lagos and be able to share a mobile virtual experience with friends and business colleagues halfway across the world? Will I be able to hold virtual meetings via my VR headset? Will the term “going online” in the future equate to entering a virtual reality world? Will Amazon become a 100% virtual reality shopping experience where I can explore the products I am interested in, in a more immersive manner? Will virtual reality become bigger than mobile? Will the future of virtual reality be mobile virtual reality? Will people be experiencing virtual holidays right in their homes? My answer to most of these questions is an emphatic, YES!!! How soon the technology will reach critical mass is what no one can say for sure, but expect the technology to improve very quickly as more investments goes into VR. While I can write about the many exciting applications of VR in the areas of movies, gaming, retail, education, arts, research and medicine, I could also write extensively about the technology itself. Especially things like fabricating your own 3-D case to hold multiple GoPros together or how to stich several VR footages together. One area that truly excites me is how Nigerian and African brands can use this technology to connect with users. 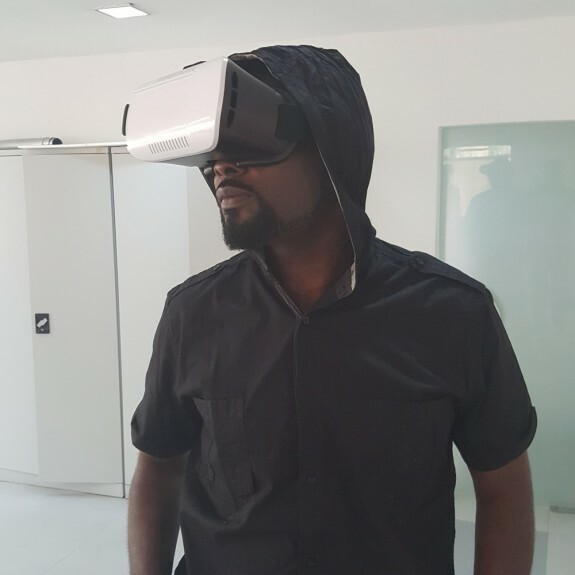 You’re probably thinking “VR” is too “high tech” for Nigeria, but I would have to disagree with you. The whole thing might sound and feel complicated, but at the end of the day it’s just a video. Online video consumption is huge in Nigeria; forget the fact that statistics show that the Internet is freakishly slow in Nigeria, Nigerians are consuming video nonetheless. I think VR just helps enrich the experience. Virtual Reality presents brands with the opportunity to transform the way we tell stories. Being an immersive solution, brands are able to tell stories in ways that offer users a more immersive user experience. Give users the right experience and they will establish a relationship with your brand. Brands are presented with an opportunity to create immersive stories that no longer interrupts the users, but gets them interacting with the content. Nigerian brands can begin to play around with the technology at events and activations, for product launches and for online content in general. The later is great for positioning the brand as an innovative one, a leader and for building brand equity, particularly among the younger demographics in Nigeria who are increasingly tech savvy and consume video in vast amounts. Virtual Reality gives brands the opportunity to give users the closest experience they can get from a product, service or place without actually physically being there. Telling stories with this new medium will be tricky though. It won’t be business as usual, but the sooner we get started and make mistakes, like the rest of the world is doing right now, the better for us. There is a lot of content out there at the moment. The majority of them done in VR format, but the stories are still best suited for regular “flat” stories. A big downside to VR right now is the cost of creating VR content; it’s still pretty pricey, but all that is expected to change as the devices begin to reach critical mass and as more players enter the space. Players like Ricoh, Kodak, Jaunt and Vuze are already producing consumer-grade cameras that require little to no post production for recording basic VR content. Not that elaborate stuff, but good and decent content nonetheless. There is currently no professional VR production outfit I know off in Nigeria, so it’s ok to get your own equipment and play around with it. I struggled to book a room on bookings.com recently, as I just wasn’t sure what to really expect from the rooms. Fine, there were pictures, but they looked exactly the same for every room and if you reserve hotels online, you know how that is never the case. In the descriptions on the website, some rooms offered me a city view, while others offered me an ocean view but the pictures on the website failed to communicate that to me. I couldn’t see what the view would actually look like. I wasn’t sure of the size of the room, as I was travelling in a company of 5. VR in this scenario presents an opportunity for a brand like bookings.com and hotels and players in the real estate space in general to personalize the presentation of their rooms to every visitor. I would be able to select the different types of room and actually experience them from thousands of miles away. I would be able to walk around the room and check out just about everything in the room, and would also be able to experience the ocean or city view from the room. It’s already being done selectively, but I expect this to really go mainstream and scale in 2016 and beyond. Marriott Hotels already does some impressive things with VR. The technology to do some of these things is easy and Nigerian brands playing in this space can play here very easily. VR presents a lot of opportunities to brands in the travel industry as well. This could really become a game changer here, with users able to experience a teaser of a choice destination or actually even paying for virtual tours without leaving the comfort of your home. Virtual holidays – with technology like Social VR in the works, multiple users could be able to share the same VR experience so you can take your family on a virtual holiday. Nigerian travel and tourist destinations could use this sort of immersive technology to give users a feel of the sight and sounds of their intended destination. I think we are going to start seeing some remarkable developments in the area of VR this year and Nigerian brands should be bold enough to join in. It will be a whole new ecosystem, which I predict will touch every industry and aspect of our lives. 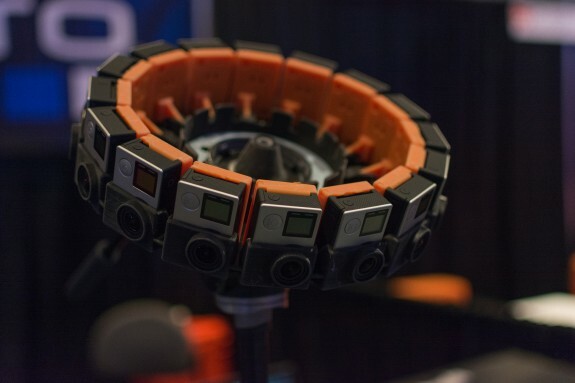 2015 saw the VR camera market grow in the area of professional equipment and investments. In 2016, I expect to see more consumer cameras, which will provide amateurs the ability to get their hands dirty with VR with practically no new skills to learn. Let’s jump in and get our hands dirty. My name is Stanislaus Martins. I am what I like to call the sweet blend of Marketing, Digital and Technology. I hate to write but I do it anyway because I know how important it is.